By December this year, foundation stone for the greenfield airport at Itanagar will be laid- Dr Jitendra Singh. 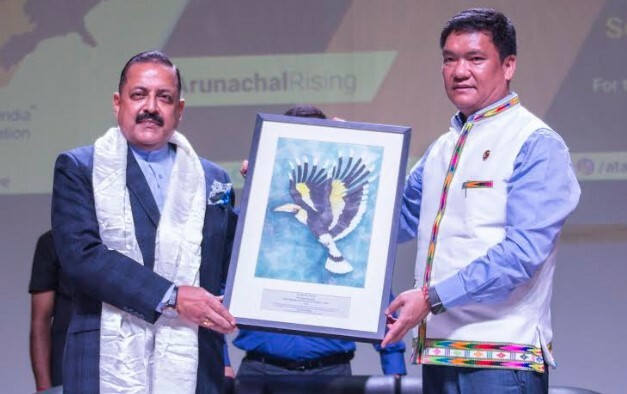 Union DONER Minister Dr Jitendra Singh today inaugurated the 3-day ATAL (Arunachal Transformation & Aspirational Leadership) Conclave in presence of Chief Minister Pema Khandu, Deputy Chief Minister Chowna Mein and other dignitaries. Speaking during the occasion, Dr Singh congratulated the state government for conducting a first of its kind conclave targeted towards the age group of 18 to 30 years to engage them proactively in areas of public policy and governance. He said former PM Atal Bihari Vajpayee initiated the work of transforming India, which is being taken up by Prime Minister now. He said wholesome growth of India is not possible if one part of country lags behind and said it was under Vajpayee that Northeast got unprecedented attention from the centre. He also said there is so much to learn from Northeast and rest of India should start coming closer to this region. Further DONER Minister appreciated the Chief Minister for taking decisive action over preference of land regarding Greenfield airport proposed for Itanagar. He said having resolved issue of land, there should be no looking back and announced that by December this year, foundation stone for the airport will be laid. Earlier speaking on the occasion, the Chief Minister said the whole idea of ATAL conclave is to know what our youths are thinking, what is their aspiration and how they wish to contribute for betterment of Arunachal. He expressed happiness that youths from all over the state numbering about 150 have come together enthusiastically responding to their call. He said the government will try to incorporate all the suggestions and solutions proposed put forward. The CM said due to limited opportunities, youths are forced to migrate to better places resulting in brain drain. He said the objective of the conclave is to create opportunities for youths by taking them onboard and engaging them in the growth process. The 1st day of ATAL Conclave witnessed impressive interactive session between the younger minds of Arunachal and representatives from State Government. Brainstorming on prevalent issues such as Education, Health, Sustainable Management of Water and Sanitation was conducted wherein officials from respective departments addressed the questions raised by the young participants of the conclave. Nehru Memorial Museum and Library Director Shakti Sinha spoke on Act East Policy – transforming India’s North East in his first keynote address.